Kids Crafts : Pool noodles are not just for swimming! Here are 8 great tips for using them differently! Pool noodles are not just for swimming! Here are 8 great tips for using them differently! Ideas for using them differently! 8 excellent ideas to use them otherwise! All these tricks are great ways to use swimming pool noodles other than to swim! 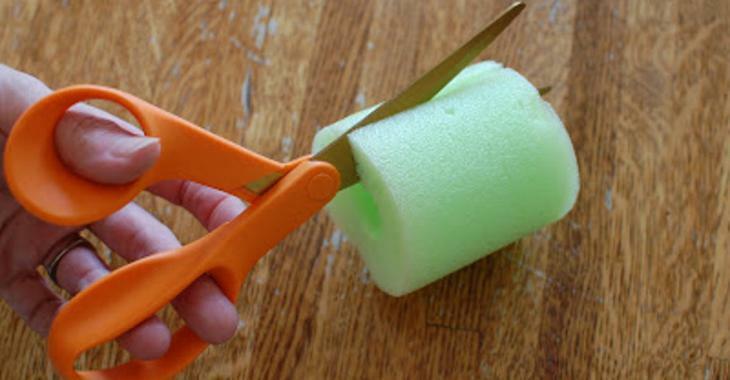 Collect old pool noodles that are breaking down for some of these ideas so as save some cash. On the other hand, for a few these ideas, you'll have to use new noodles. But since they are very inexpensive, all these tricks are very economical! Cut the noodles along the length so you can thread them on the springs and protect the children's hands! Get the pool noodles crumbling! Do not throw them away! They make beautiful pieces to play Tic Tac Toe with duct tapeDuct TapeOn carpet! Use two different colors or two different noodle shapes! Prevent small children from getting their fingers in the doors or getting into a room by barring the door, like in the bathroom for example! By sticking a pool noodle on the mattress under the sheet, a child will not fall down his bed! If you are gifted in sewing, this will have no secrets for you! With suction cups and elastics entertain children with pierced noodles! Make waterfalls! Must think about it! But your child will be much more comfortable sitting as well! A simple strap holds everything! A cut pool noodle and a half noodle pool on the first. Glue them with the hot glue gun. Cut it on the length and always drag it in the car! Enjoy the children for hours, without necessarily spending a fortune! A little time, tough tape and your watering hose and the ride is played!